Game sequels can be tricky. In hindsight, they tend to be inferior to their predecessors, but some do manage to break the mold just enough to make them as good, if not better than original. The first Asdivine Hearts title, which I reviewed last year, caught me by surprise because it transcended the usual “OK factor” that comes along with the majority of EXE Create / KEMCO RPGs. That’s not to say that OK is bad in the realm of budget RPGs by any means – in fact – I’ve enjoyed almost every KEMCO published RPG that has come to Switch thus far, despite their flaws. But there was clearly something special about Asdivine Hearts, which is why I was very much looking forward to its sequel. Let’s find out if Asdivine Hearts II is as entertaining as its forefather, shall we? 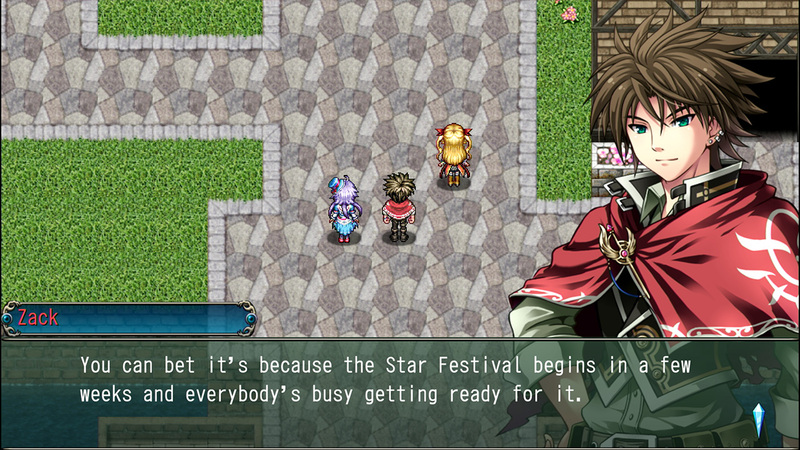 Asdivine Hearts II takes place two years after the events of the first game. Although a synopsis is available that hastily sums up prior events, it does not provide enough context necessary to grab a newcomer and make them invested in the world. Additionally, the first hour or so attempts to catch up on events that have taken place in between both games, and might prove to be overwhelming to those unfamiliar with the original cast. Because of that, I would not recommend jumping into this game without first playing the original even though you technically can if you really want to. 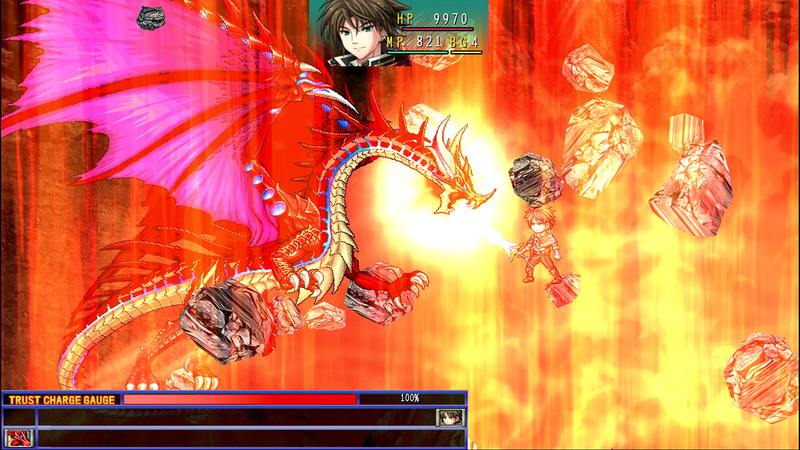 Without spoiling anything from either game, the plot in the Asdivine Hearts series primarily revolves around two things: deities, which are naturally-opposed god-like beings that work in tandem for the sake of balance in the world, and the game’s multiverse, which are infinite worlds not so different from Asdivine that splinter off and shape up in their own unique ways. 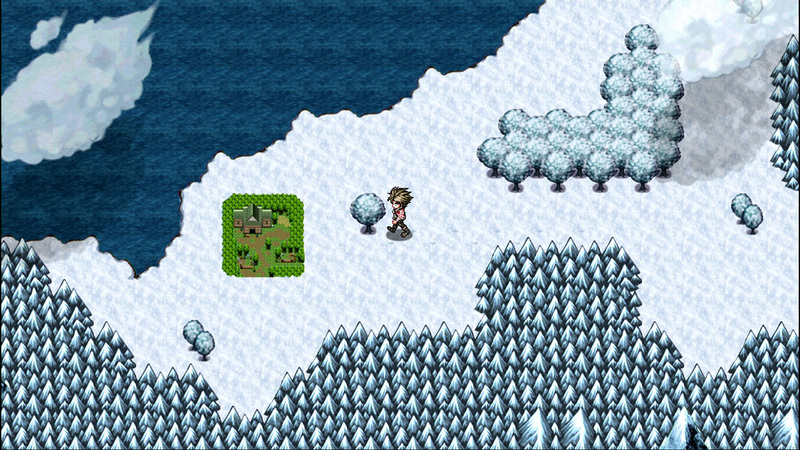 The journey in Asdivine Hearts II specifically begins when a parallel world is faced with a remorseless winter, which has not waned in the slightest since its inception almost two years ago. Suspecting that the change in weather has to do with misplacement of faith in the deities AND realizing the potential damage of the situation if it were left to its own devices, the same adventurers from the first game, including a couple of surprise additions, band together once more in hopes of saving Archelio from its frigid demise. Multiverse globetrotting can be a tough act to pull off properly in any game, but the limited depth of Asdivine’s plot lends itself to the sci-fi trope being easily palatable. And while the story itself is decent enough, it suffers a lot from the banter amongst the various party members. The first game balanced humor and serious tones well, but the sequel’s humor fares worse because it leans heavily on the same principles firmly established in the prior entry. Recurring characters are given no additional depth or characteristics in Asdivine II, so the frequent flirtatious, and sometimes awkward moments between individuals that felt natural in the first game just feel a bit odd this time around. All of the female characters end up having a thing for the main character, Zack, and based on their actions you would think they have never seen a man before, took one too many “lady Viagras”, or both. I get that the harem subsection of anime is appealing to some, but I do not find myself as interested in the concept in the second installment into the Asdivine universe. These playful exchanges were amusing in the original game because you were getting to know each character, but now it just comes across as a bit forced. I commend the developers for allowing plenty of room for comedic relief in a genre that often comes across as tightly wound, but the subject matter ends up being a little too tasteless because it remains the same exact experience as before. Really, when every scripted event leads to one or more party members (sometimes all four) lusting over the main character, it is easy to see why things are getting a bit out of hand. If there’s one thing you can say about EXE Create RPGs, it is that they are always trying to throw something a bit unique into their formulas. 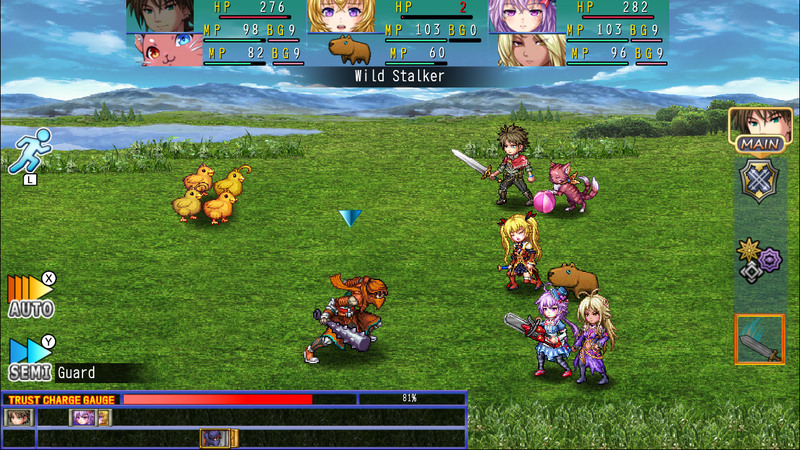 While I totally expected the sequel to play it safe, Asdivine Hearts II actually features a brand-new battle system. Turn-based combat is still the name of the tune, but the execution is a bit different thanks to the new team system. Combat is once again structured around the vanguard (100% DMG:DEF) and rearguard (66% DMG:DEF) positions, but this time you must also pair up characters to form teams. These teams share a health pool and have their own spells, abilities, and individual MP reserves to consider. While team members in the front row are capable of melee and ranged abilities, the back row companions can only perform ranged attacks. Individual team members don’t have to perform their own separate actions though, they can also work together to increase the potency of abilities, and even discover special dual-casted abilities akin to the band system in Final Fantasy IV: The After Years. Additionally, Stella, the lifelong “friend” of Zack and monster trainer from the first game, provides access to the buddy system: a very basic Pokemon-like companion system that serves as one half of one of your teams. There are few dozen of these creatures to collect through drops and other activities, each with varying abilities at their disposal. The combination of the team and buddy systems make for an overhaul to the combat system that I did not expect, but very much appreciated. As much as I welcomed the changes brought with the new battle system, I was happy to see a few things returned from the previous game, most notably the rubix and synthesis systems. The rubix system is back, which allows you to insert jewels into a cube in a Tetris-like fashion. The jewels provide various bonuses to the the character, from statistical bonuses to completely new abilities. In Asdivine Hearts II, everyone’s rubix starts out at maximum size, which is entirely different than the first game that had you upgrading their capacities along the way. The change is appreciated as it is one less thing you have to worry about during your adventure. It’s no surprise that micro-transactions have reared their ugly head once again in Asdivine Hearts II, but are they that bad? As is the case with most EXE Create RPGs, you can safely ignore them…for the most part. There are two main problems with this game in particular though that stem from the previously mention weapon drops (or lack thereof) and the character trust system. While I won’t retread old ground in regards to weapons, it should be noted that acquiring decent weapons naturally can be troublesome if you choose to ignore the in-game shop entirely. Asdivine Hearts II is not necessarily a consistently difficult game, but still, having the most elite weapons gated behind a luck of the draw micro-transaction system is a bit disheartening to say the least. Also, the trust system in Asdivine Hearts II all but requires you to invest in the cash shop items to fully take advantage of the mechanic. Each character has a trust level that can fluctuate depending on how you respond to certain situations, and it plays a role in gaining access to some optional locations, as well as factoring into the ending itself. You can also increase a character’s trust by giving them a rare item found in the world, which is conveniently available in the cash shop too. Thanks to the inconsistent translation, however, trust events may not play out as you would expect, resulting in a decrease in any given character’s trust level. Additionally, the trust items available to you organically are so sparse that they won’t completely make up for your potential mistakes along the way. Even if you were to optimize your trust potential naturally, you would still likely have to purchase items from the cash shop to fully max out each character’s trust level. To be fair, you are able to accumulate the shop currency simply by doing in-game activities, but I’ll never be an advocate for micro-transactions in a full priced game that go beyond offering cosmetic and/or QoL enhancements. 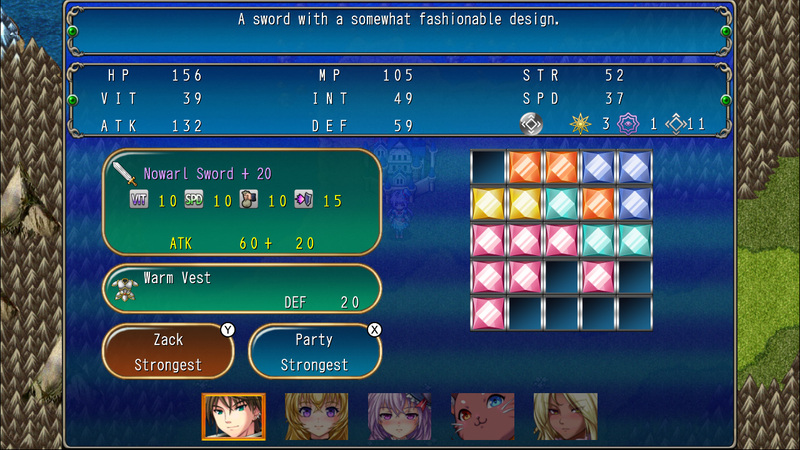 There’s not much to be said in regards to graphics that hasn’t already been mentioned about other EXE Create RPGs. Many people despise the “RPG Maker” look, but judging a game based on a particular style is a sure-fire way to miss out on some diamonds in the rough. My biggest gripe with these games when it comes to graphics has always been the lack of creativity in asset design and placement. Hand-placing objects in locations like towns help them feel like lived-in, believable destinations, but Asdivine Hearts II, unfortunately, does not buy-in to that concept whatsoever. That said, the in-combat graphics are actually quite nice, with some of the larger enemy sprites being very pleasing to the eye indeed. Unsurprisingly, Asdivine Hearts II only pulls from a small pool of songs for the entirety of the game. As was the case with the first game though, the actual quality of those tracks are not bad at all. Some of them are remixes of the original tunes, but are superior in every way. You can always expect an RPG from EXE Create to have at decent music at the very least, but the Asdivine series in particular has proven to raise that bar, if only slightly. Performance is solid, though I did notice the occasional glitch in framerate that could have been a byproduct of the new weather effects used in certain areas. I noticed the slowdown primarily in docked mode, so it could very well have to do with the settings / game mode on my own TV, but I cannot say for sure. Either way, the slowdown is not common and is a very minor issue in the grand scheme of things. 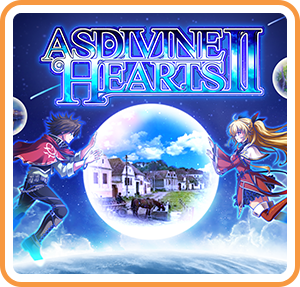 Asdivine Hearts II manages to transfer – and improve upon – systems from the original game in a way that should be interesting to series veterans and newcomers alike, but the subtle influence present in mechanics tied to the cash shop will likely not sit well with everyone. The harem, emotionally-charged situations that helped define some of the characters in the first game are just not as enjoyable after you know what makes each character tick, and especially when they become the basis for all of your comedic relief. As a result, Asdivine Hearts II proves to not be quite as interesting as its predecessor despite featuring some systematic improvements, but is still not a bad investment as a budget JRPG title.